His popularity dented, Japanese Prime Minister Naoto Kan toned down his tax hike talk on the eve of Sunday's parliamentary elections that are widely considered a referendum on the Democrats' 10 months in power. Candidates scurried around in campaign vans, speakers blaring and aides waving out the window, stopping here and there to give speeches throughout the country Saturday. The vote, where half the seats in the 242-member upper house are up for grabs, won't directly affect the ruling Democratic Party of Japan's grip on power because it has a hefty majority in the more powerful lower house that chooses the prime minister. But recent polls show Kan's party will likely lose seats in the upper house, which could complicate its ability to pass legislation and force it to find new coalition partners. Kan has set a target of winning 54 seats, the same number as the Democrats have now, but newspaper surveys suggest the party will more likely get about 50 seats. 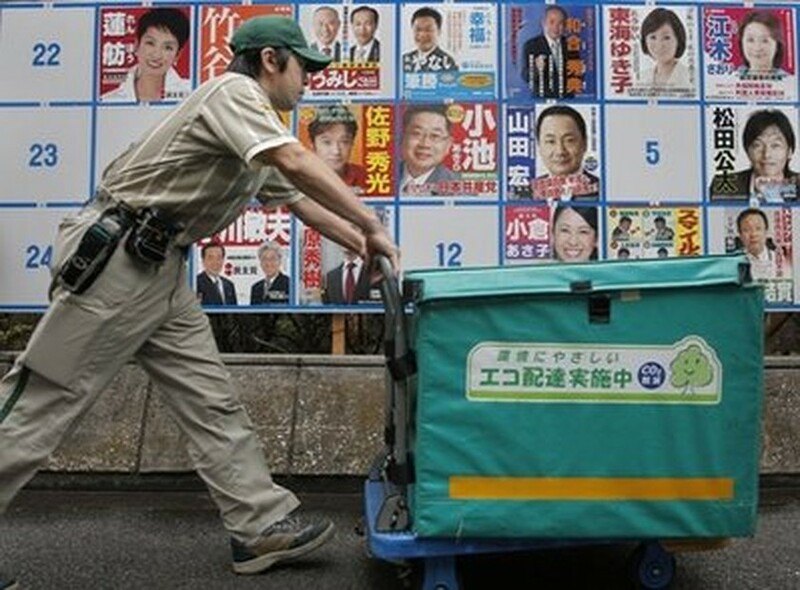 A delivery person pushes a cart in front of posters of candidates for the July 11 upper house elections in Tokyo Friday, July 9, 2010. Promising to cut wasteful spending and bring more transparency to politics, the Democrats swept to power in lower house elections last August that ended 55 years of nearly unbroken rule by the conservatives. So far, they have delivered mixed results. The Democrats have put the brakes on many large public works projects considered wasteful, but their first prime minister, Yukio Hatoyama, disappointed voters by breaking a campaign pledge to move a U.S. Marine base off the island of Okinawa and getting mixed up in a funding scandal. Kan, a plain-spoken former finance minister with a grass-roots activist background, enjoyed an initial surge in approval ratings when he came to office just a month ago after Hatoyama's resignation. But his suggestions that Japan needs to raise its sales tax from 5 percent to as high as 10 percent in coming years has weakened his Cabinet's — and his party's — popularity. Kan argues tax reforms are necessary to reduce the country's ballooning public debt as the population in the world's second-largest economy ages and declines. He has warned if it doesn't take aggressive steps, Japan could face a Greece-like fiscal crisis — a comparison that experts say is a stretch because most government bonds are held by domestic stakeholders who are unlikely to dump the securities. Attempting to show his party is fiscally responsible, Kan may have miscalculated, analysts say, assuming many voters think higher taxes are inevitable. Over the last several days, Kan has shifted his focus to talking more about welfare and economic growth strategies, promising in speeches that the Democrats won't raise the sales tax until after the next lower house elections, scheduled for three years from now, saying he wants a public mandate on the issue. 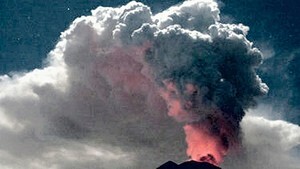 "We will not raise sales tax until the next lower house elections, not even 1 yen," he said in a speech Friday. The Democrats and their tiny coalition partner, the Peoples' New Party, currently have a slim majority with 122 seats in the upper house. The main opposition Liberal Democrats — a conservative party despite its name — are projected to pick up about five seats to bring their total in the chamber to about 76. A total of 437 candidates from 12 parties are vying for the 121 spots. The public's interest in the election has wavered as the campaign has coincided with the World Cup — in which Japan's team did better than expected — and a scandal that has hit the traditional sport of sumo wrestling. During the past two weeks, major TV Japanese stations devoted about as much time to the sumo scandal as to the election — and far more hours to the World Cup, according to calculations by the mass circulation Mainichi newspaper.